London: Simpkin, Marshall, Hamilton, Kent & Co.
Before the Arab Conquest in the 7th century, the peoples of Egypt spoke the Coptic form of Greek or Egyptian. They soon adopted the Arabic language, which became Egyptian Arabic or Masri. In late 1932, Dunedin’s own Charles Brasch (1909-73) set out on a three-year archaeological expedition to the ancient Egyptian city of Tell el Amarna. He was to accompany his friend, papyrologist Colin Roberts, and the trip necessitated learning Egyptian Arabic. Brasch loved the language and described it in his memoirs as a ‘language organized with beautiful economy and concentration…’ Today, Egyptian Arabic is spoken by over eighty million people worldwide. 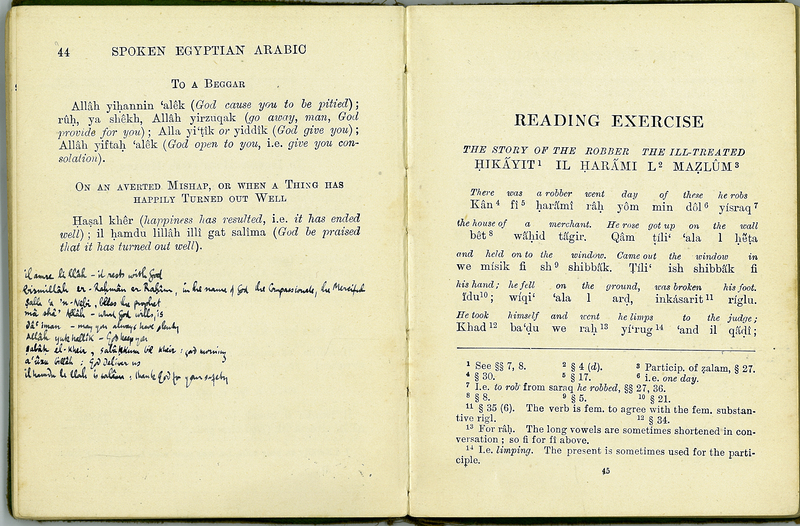 Here is Brasch’s Egyptian Arabic Handbook, with notes in his neat, compact script. J. Selden Willmore, “Handbook of Spoken Egyptian Arabic: Comprising a Short Grammar and an English Arabic Vocabulary of Current Words and Phrases,” ourheritage.ac.nz | OUR Heritage, accessed April 26, 2019, http://ourheritage.ac.nz/items/show/10774.